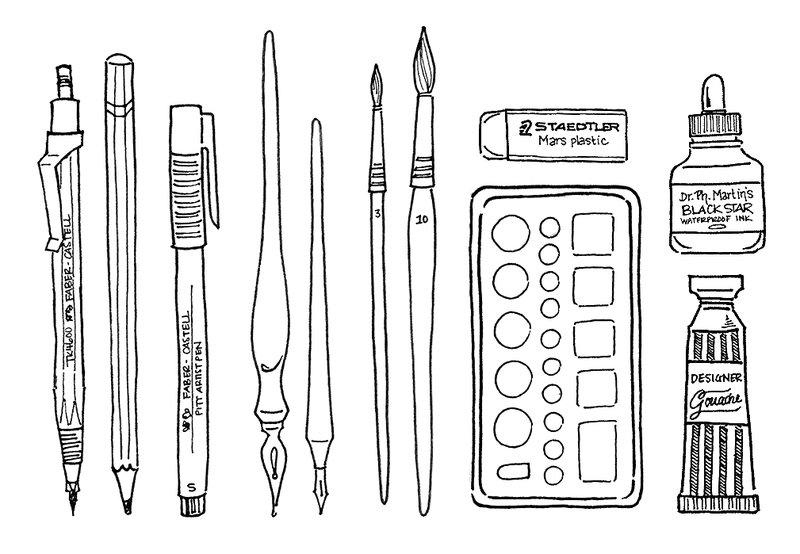 As Manga Artists, new or old in the hobby, we know that a trip to the Art Store is dangerous for our wallets. Getting that one shade of graphic marker or a pencil may lead to a full basket of things that some of us may not need or cannot afford. So this series will cover some of my tips on how to buy materials, where to buy them and what to buy especially for those of us looking to create Art on a Budget. Tip # 1: Make a List. The worst thing we can do when manga material shopping is going to National Bookstore or any Artshop without a list in hand. The reason is simple: If you don’t have a list, you obviously don’t have specifics on what you are looking for and what you need. Going without a list might also lead you to buying things that you already have and that is a waste of time and money. Without your list, you will go around and around in circles, not knowing what to get and really get frustrated if you either waste too much time being unsure of what to get and not getting anything at all or getting way too much. So, Marikit, what do I put on my list? Well… here are tips on how to make your list of things to buy before you set off shopping. Pencil – whatever you are comfortable with is fine but softer lead is better if you want to save your paper from being damaged by pencil. Kneaded eraser/Gum Eraser or a good quality soft plastic eraser. – getting the wrong eraser or a hard eraser might ruin the paper as you erase and ruin your artwork. Inking Materials – most people start learning from inexpensive gel pens and then moving up to drawing pens. However if you are into drawing pens already , I suggest getting: 0.05, 0.1, 0.3, 0.5 in any brand (though i love unipins) and if you can find a good permanent marker with a fine tip and a brush marker (though the brush marker is only good if you can afford it). However here is one tip i want to share: For inking large black areas, use: black paint or china ink and a brush. It saves you money because china ink is cheap! Paper: if you intend to keep and color your art, think of smoother the better. 70 gsm paper is good for sketches but its hard to maintain especially if you are a deep penciller. Depending on your art style I recommend vellum boards ( or the ones used for calling cards ) that are inexpensive but good for art. the GSM must be at least 120 and above with smooth finish ( depending on what coloring material you are using) Personally, I use 220 and above vellum or bristol boards A4 size ( industry standard) or 8 1/2 x 11 ” (short ) size. They hold up well to inking with nibs and my graphic markers, colored pencil and watercolor. Plus, it is nice to keep after since it will last longer than ordinary copy paper. Get good quality material for your best medium. I am a firm believer in QUALITY over QUANTITY and so if you are confident in using a certain medium (say: colored pencils or watercolor pencils) you should splurge a little on that because you can create more work on that. However, if you are an artist with existing materials, check what you have first and list down things that you really need. 2. Plan out your budget. – list out things and prices so that you will not go overbudget and spend too much. 3. Research and Canvass before you list- before you go out and buy things, check on prices online and offline and research different places to go to get the cheapest stuff. Make sure you also factor in your time and fare to go there. If you know the price of the thing you need, then you will not go over budget and maybe researching can lead you to places where you can get it for cheap. 4. Know the difference between the materials you want and what you need so you can plan out what to buy.- I admit that i fail when it comes to this because my wants seems to be my needs but if you are on a budget, it might be smart to list things down first on a separate piece of paper and ask “DO I REALLY NEED THIS?” or “CAN I CREATE WITHOUT THIS?” and BE HONEST with yourself when you answer that. Once you are done, transfer the narrowed down list on another sheet and get ready to shop! I hope these four tips help you prepare for your next shopping trip for art materials. Stay tuned for the next tip to create ART ON A BUDGET: Where to buy? Reblogged this on Idiosyncratic Inklings.